September saw the launch of a major new Oschadbank program focusing on support for the Ukrainian Small and Medium-Sized Enterprises (SME) sector. The state-owned bank’s “Buduy Svoe!” (literally “Build Your Own!”) SME initiative aims to foster the growth of the country’s entrepreneurial class while contributing to the bank’s further modernization and commercialization. It is an important component part within the broader roadmap of cooperation between Oschadbank and the European Bank of Reconstruction and Development (EBRD), which foresees technical cooperation with a view to future privatization and possible partial acquisition of Oschadbank by EBRD. 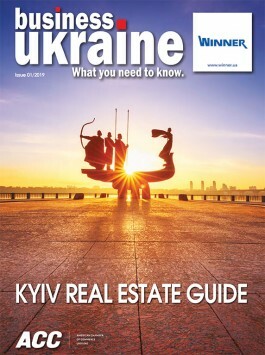 Business Ukraine magazine spoke to Chairman of the Oschadbank Management Board Andriy Pyshnyy and EBRD Director for Ukraine Sevki Acuner about the importance of the SME sector for the broader Ukrainian economy, and the role this new SME focus can play in the ongoing post-Maidan transformation of Oschadbank. Oschadbank’s current cooperation with the EBRD was formalized in a November 2016 Memorandum of Understanding signed between the bank and the international financial institution together with Ukraine’s Ministry of Finance, creating a roadmap towards improved Oschadbank corporate governance and commercialization of the bank. The process of comprehensive modernization began in 2014 in the months following a major overhaul of the bank’s management that came in the wake of the Euromaidan Revolution. One of the central Key Performance Indicators (KPIs) of this strategic partnership is Oschadbank’s ability to establish itself among the top three Ukrainian banks in the SME sector – a segment of the Ukrainian economy where the bank had previously been absent. In 2015, Oschadbank formed a dedicated SME team and began laying the groundwork for the recently launched “Buduy Svoe!” program. In doing so, Oschadbank is far from the only bank in Ukraine to focus its attentions on the SME sector. Small and medium-sized businesses are currently the hot ticket among Ukrainian banks looking to return to larger scale lending following an extended lull since the lows of 2014-15. There is clearly significant room for growth in the segment, with the number of SMEs currently active in Ukraine representing a far lower proportion of the overall economy than in neighboring European countries. “If we look at the official statistics for Ukraine, they tell us 64% of GDP is generated by the SME sector. However, in reality, the figure is not more than 15%. The rest represents large businesses using SME tools for tax optimization purposes. What we really need as a country is a genuine entrepreneurial class,” offers Mr. Pyshnyy. He talks about providing a complex program to create two million new Ukrainian entrepreneurs and points to the Polish experience for inspiration. Neighboring Poland has a robust SME sector of over three and a half million entrepreneurs from a population of 37 million. This helped the country to avoid recession and maintain modest growth in 2008 despite a global crash that hit the rest of the European Union hard. “Today, Poland has a GDP of USD 470 billion compared to Ukraine’s USD 90 billion. In 1991, the figure for Poland was lower than for Ukraine,” says Mr. Pyshnyy. Developing services for new segments is part of the post-Maidan Oschadbank management team’s DNA. The bank entered the online banking market for private individuals just a few years ago, and has already grown its client base from around 13,000 to 2.3 million customers, making it the number two bank nationally in this segment. It has begun offering premium banking services and has implemented the well-received governmental “warm loans” initiative to provide financing for households looking to invest in energy efficiency, warmth retention of houses, and decreasing natural gas consumption. Oschadbank granted two-thirds of all loans by volume within the framework of this program. As Oschadbank now seeks to expand its footprint in the SME sector, it faces competition from the significant number of Ukrainian banks that have also identified the sector as a potential growth engine. Mr. Pyshnyy acknowledges the inevitable challenges this crowded marketplace creates but believes Oschadbank’s multipronged approach will prove sufficiently appealing to help the bank achieve its stated objective of entering the national top three in the SME sector. The “Buduy Svoe!” program offers a range of benefits beginning with a starting package that allows entrepreneurs to begin operations quickly and conveniently. 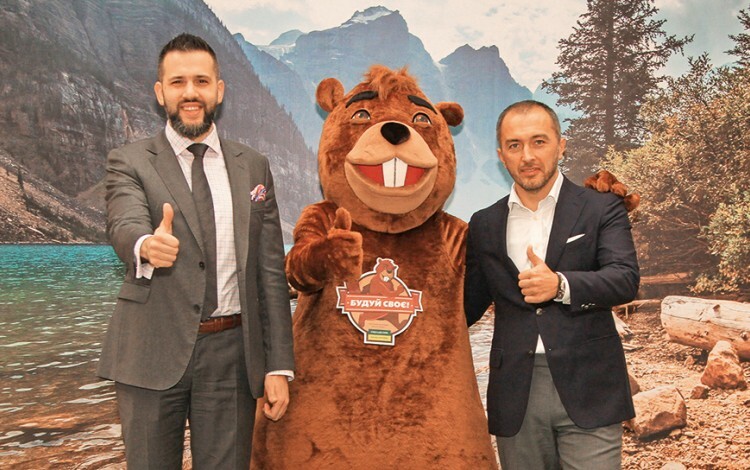 The brand for the program features a beaver mascot, something Mr. Pyshnyy says is characteristic of the diligent and dynamic mood the bank wishes to convey to the public. The starting package that entrepreneurs receive is significantly simplified. It looks similar to the kind of package offered by mobile operators. Entrepreneurs receive a small crafted box containing a banking card, hardware with a digital signature, and what was formerly a 32-page contractual agreement reduced to just a single double-sided sheet of A4. A mere two signatures are required in order to activate the account. The entire process of activating an account takes one hour. In addition to the starting package, clients of the bank also benefit from access to a range of services by partner companies of Oschadbank on the kind of advantageous terms usually reserved only for large-scale corporate partners. Oschadbank has already concluded cooperation agreements with Kyivstar, Microsoft, Google and Nova Poshta, with a number of further tie-ins currently at the negotiation stage. “Our mission is to simplify the life of the Ukrainian entrepreneur from the very outset of their business activities,” says Mr. Pyshnyy. To join the bank’s educational portal (buduysvoe.com) users require only a willingness to participate and complete the online registration process. Online education, free consultancy and variety of useful articles for businesses are available to entrepreneurs following registration. For example, users can take a detailed 60-question test to analyze their entrepreneurial strengths and weaknesses. In addition, after receiving their results, they can then apply for individual information. A pool of thirty mentors, who are already listed on the portal, are available online to offer free and personalized entrepreneurial guidance on a case-by-case basis, while there are also online training courses covering themes such as common legal and tax issues. Mr. Pyshnyy stresses that the range of online services available via the portal will continue to expand in the coming months in an organic manner as the bank receives feedback from the SME community, with the program’s Facebook page set to serve as a key platform for two-way dialogue. Not all local authorities have been eager to embrace this new line of activity. In order to provide a persuasive model for greater SME cooperation at the regional level, Oschadbank is currently developing a pilot project with the local authorities in the city of Vinnitsa, whereby the authorities would partially cover the cost of SME loans depending on tax paid by the entrepreneur. “The goal is to establish a new paradigm of cooperation between the SME business community and the municipality,” explains Mr. Pyshnyy. Oschadbank has also launched a comprehensive information campaign to promote entrepreneurship as an idea to embrace on the national scale. Twenty-six TV commercials feature so far in the campaign, with each advert providing a short but concise message through a story about a specific entrepreneur who has been brave enough to launch their own business. The idea is to focus on the importance of the SME sector for the Ukrainian economy as a whole.